2017 I have so much to thank you for, especially the "spiritual" feeling childbirth gave me - meeting my little baby girl for the first time . Life is now just full of firsts - the smiles truly melt my heart everyday. My daughter was 14 weeks old yesterday and what a journey. I've always been a big believer in the best way to get things done is call in those who know what they are talking about. 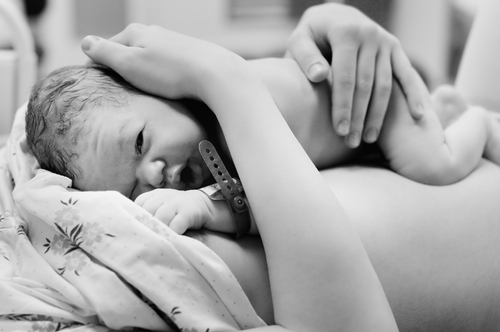 I had never been to another persons birth so for this reason I wanted to work with an experienced doula. This was fantastic my very own "mother coach" with pep talks in my bathroom 'you've got this" and support as I moved around my home in and out of the birthing pool. Looking back now and reflecting how lucky I was to have the birth I had planned as I speak to many new mum friends and hear the difficult times they experienced. I urge anyone who is pregnant and if they can to look into getting support from a doula, even with my husband by my side this was a form of consistency of care which is unfortunately not obtained in a hospital setting the same anymore. My anxiety around birth was reduced also once I knew how my support network was going to be and I was in great hands. Michelle was my rock on the day working closely with the home birth midwives. Wendy the primary midwife was the most experienced and reassuring midwife a girl could ask for. Thank you also again Ali from Hypnobirthing Mumma who in our 4 sessions together had equipped me with the skills prior to the big day to instinctively manage my pain naturally. I even admitted to her recently that I actually enjoyed the first stage (10hrs or so) of labour (this is not active labour) and the power of being in control of my breathing as the pain became more intense. I still feel very blessed to have had my first baby at home. I truly appreciate this isn't a luxury for everyone or a home birth isn't the choice many would choose (I was considered low risk & my pregnancy had been very straight forward. So please don't rule out a home birth until you know all the facts). As this was my first baby I did have the time to absorb as much (oh and I did) antenatal information as possible, plus my very supportive husband was taken to numerous meet ups including home water births evenings and positive birth groups (The Positive Birth Group) - all of which demonstrated to my husband how important it was for me to be informed and how "normal" the mothers and couples looked, and all my childbirth aspirations were not some crazy hippy idea. The way I see it is too many women don't plan enough for how they want their birth to be and just hand themselves over to the hospital without being informed of their rights and choices (when else would you do this?). The energy that I had put into planning my Wedding and Honeymoon the year before was so superficial in comparison, so of course it made total sense to invest (emotionally & financially - a home brith actually costs the NHS less) totally in the most important event I feel as a woman I will ever do. To help with the physical control throughout the pregnancy I attended "active pregnancy yoga" with the fantastic Natalie Meddings who is also as a fantastic doula, she brings together new mums-to-be in a supported environment and talks through concerns and helps reassure mums-to-be of how women are designed to give birth (even though you can never really describe active/final stages of labour until you experience it!). What was interesting though is that the emotional side of becoming a mother really didn't dawn on me till the very end of my labour (the last three hours) Michelle would remind me of this and without this innate belief my body would not have finally progressed naturally surrendering to the final push as I learnt to accept this powerful shift in my emotional being of becoming a mother. Thank you 2017 I will never forget when my daughter arrived and how we just lay holding each other as time just stopped. Is cereal a healthy breakfast? IT’S QUICK, IT’S CHEAP AND WE EAT MORE OF IT THAN ANY OTHER COUNTRY. IS IT HEALTHY THOUGH? Accept that eating healthy is a lifestyle change, not a diet. We all slip up from time to time. One of my clients has tried every diet going, and I was thrilled when she announced the other day that she finally realised eating healthy can be enjoyable – and that it isn't a form of punishment. Dr Steve Peters' book The Chimp Paradox argues that the mind is made up of three separate ‘brains’: Human, Chimp and Computer. You are the Human, your Chimp is an emotional thinking machine, and your Computer is a storage area and automatic functioning machine. Learning to understand your Chimp, and its emotionally driven and often impulsive eating habits is key. Peters says, “One of the secrets of success and happiness is to learn to live with your Chimp and not get bitten or attacked by it”. Planning for perfection sets you up for a fail. No-one can (or should) be 100% perfect, 100% of the time. So you’ve had a setback from your healthy eating plan. We all make mistakes - accept it and move on. Life is too short to dwell on what can’t be changed. Live in the now. Make your next decision the right one. You may be impatient, with an unrealistic goal and unrealistic expectations. A successful weight-loss plan means losing weight at a healthy rate. Forget fad diets and what celebrities manage with their private chefs. Ironically, this kind of dieting actually leads to more dieting, as yo yo diets and a fluctuating weight play havoc with your metabolism and make you more prone to putting on weight. And who wants to survive on shakes or juices, anyway? If you have become overweight because you enjoy eating, then eating should be a pleasure. Now is the time to embrace new nutritious foods and how good they make you feel. So you’ve tried going it alone and it hasn’t worked. Don’t be afraid to ask for emotional support when the going gets tough, whether that’s a professional such as a nutritional behavioural therapist or a friend. Find a training partner for the gym, too. Exercise is always more fun when you have someone to talk to and share achievements with. And it might just bring out that competitive spirit. It’s worth bearing in mind that we are all different, and what works for someone else may not work for you. Don’t give up! Food can be an immediate reward and is so easily accessible these days. Since childhood, most of us are led to overeat and consume too much sugar. “Finish your dinner and you can have pudding” – sound familiar? Break that habit! Set yourself mini-goals and plan a (non-food) treat each time you achieve it. Maybe a fresh manicure, a new magazine or tickets to a gig? Give yourself some “me” time – perhaps book out a whole Saturday to do whatever YOU want and don’t feel guilty about it!